Several weeks ago I received an e-mail telling me I had been nominated for the health category for an exceptional women award of the local Spanish newspaper La Prensa. I was very surprised, I had no idea who nominated me. One day while I was speaking with a dear friend and just having our usual “therapy”, term I use for the great conversations we have about everything and anything, I mentioned the nomination, and she was so happy for me, and guess what… she had been nominated as well. What a wonderful thing, people might think we were competing, but that was not the case. We were anxiously waiting for the award /luncheon ceremony to enjoy some time together. The award ceremony day arrived, that was today. It was a very elegant event, full of beautiful distinguished women. We had the opportunity to see many community partners we work with, and friends, as well as network and engage with new amazing women. It was a calm and nervous experience (If that makes sense! ), I prayed for my friend to win or the other exceptional women nominated on our same category. 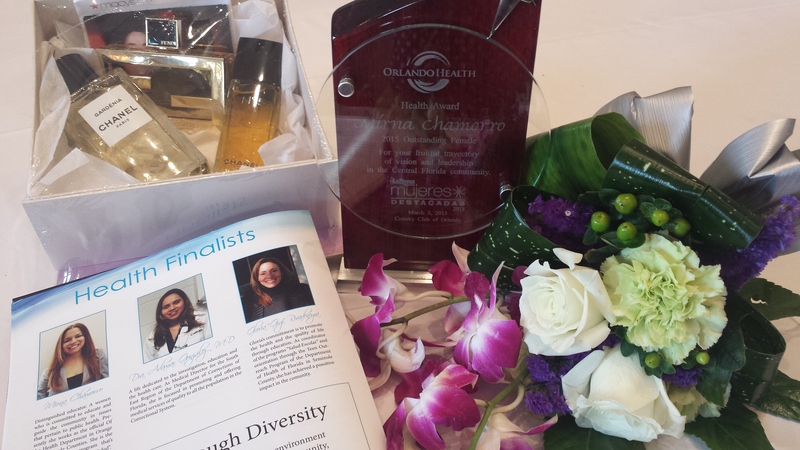 Outstanding women were announced as finalists and the winners were announced for the different categories: business and technology, leadership, education, arts, and …health. Our names were announced and our pictures were shown on the screen, we smiled, we cheered, and the winner is… Mirna Chamorro. I could not believe it, my eyes filled with some tears, but no time to cry, I hugged my friend and walked up to the stage to receive my award. Pictures…selfies… smiles… and congratulations…was most of what was heard and seen in that room. It was a very nice and quick experience. It is an honor and I share this award with my friend and the other finalist, they are truly exceptional women. I am who I am and I do what I do because of God’s grace. He is the one who allows me to work and serve, and do everything always for his honor and glory. Sometimes life’s challenges are hard, but I know that I can only conquer with my Lord, who gives me strength. This award is for my Lord. I am who I am because of the legacy my parents have given me. They brought me up in a loving and caring environment, they taught me moral and Christian values, and they showed me by example. This award belongs to my parents. I do what I do because of the love and sacrifices of my husband and children. They love me, respect me, support me, help me, they are there for me in the good times and not so good ones. This award belongs to my hubby and kids. I am who I am because of the prayers, love and support of all my extended family and friends. So many people are dependable, trustworthy and loving. This award belongs to them. The opportunities God has given me to work in the health field, educate, be a resource, meet extraordinary people, have great mentors, learn, serve others, and much more… are the biggest asset and prize anyone can ask for. I am very grateful for the opportunities that come and I pray I will continue to be humble and pay it forward. I work without asking anything in exchange, I work because of the passion I have towards the community and health. It has been a rewarding ride so far… and I thank La Prensa newspaper and the “Mujeres Destacadas” committee for this recognition. I pray God continues guiding my path now and in the future in the new phases of my life. My prayer is… “I can do all things through Christ who strengthens me.” Philippians 4:13. 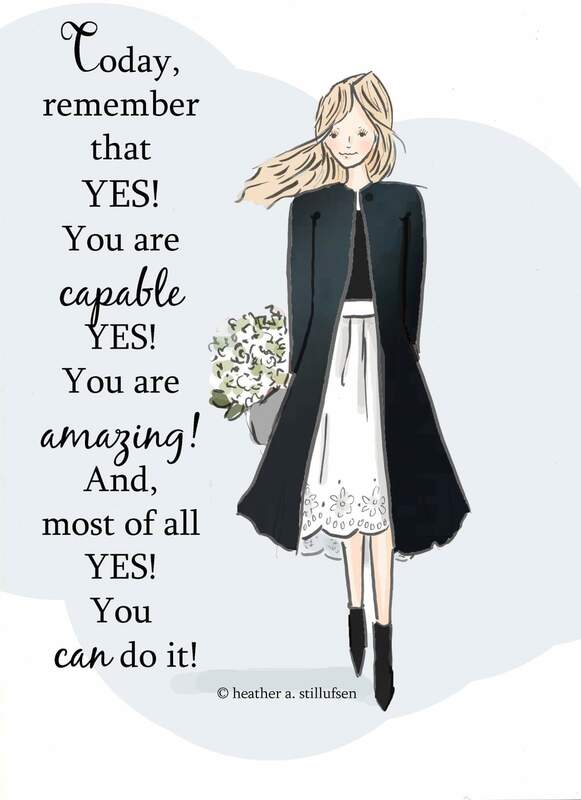 I love this illustration by Health A. Stillufsen and so encouraging to all of us as women, we can be outstanding, and achieve our goals, we can do it if we put our heart to it and do it with love and prayer. With God’s help we can do many things. Keep up the great work you do!